For the second year, Canal NY is proud to partner with member JMF Publications in their popular Upstate Summer Magazine. JMF created a section on New York’s Canals for the 2018 edition. We are hoping to build on the success of last year’s efforts again in 2019. The section is comprised of multiple pages about summer recreation on and near New York’s Canals. It will contain a feature article, pictures and advertising. Upstate Summer is different from other places-to-go publications. All advertising is focused on travel and tourism related businesses and is supported by editorial features. This makes the ads part of the content and helps form cohesive regional sections. 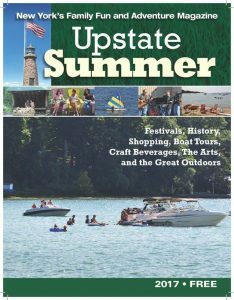 Upstate Summer has low cost per copy advertising rates and is the only New York travel publication offering multi-region coverage and targeted distribution in the most desirable markets. In 2018 every distribution location used 100% of what they had by the end of the season. There was no waste!